Played Saturday, had mostly wins (usually 1-sided blowouts). Had a close shave in Taiho, reacted a bit late to a Gearing coming my way and got hosed w/ HE. Fortunately the CV-hating Ibuki was bad at dodging my TB, a NC came to my aid, and the Gearing was dumb enough to keep giving away his location. Easy Devastating Strike! Spent some of my command XP to respec an 11-point captain for Tachibana and quickly reminded how slow the DDs at that tier are. Lexington was mostly frustration. In all but 1 of the matches played, I faced ridiculous T10 AA and more than once left the match simply because being unable to do much in a CV spoils the fun of using her. Ended up free XPing to Essex. WG really needs to tone down the uptiering frequency of T8 CVs a bit since no fun facing murderous AA. Oh well! Makes my free XP stockpile worth hanging onto, it seems. Ran into Kongo_Pride and ended up doing enough damage that he grabbed kill steals off whatever reads I knocked to low HP. Nasty DD player that match! Thought you were taking a break for a while, Reymu? It was terrible Friday and Saturday, finally remedied a little on Sunday evening / early morning on Monday. Managed to get my numbers back up a bit. Mostly played co-op because I have been doing horrid lately. I did play some CW where I actually did well although a lot of those matches was being bait, I got to 6 enemy after me a couple of times and lived, it is a dirty job but someone has to do it. One of those bad, bad weekends. 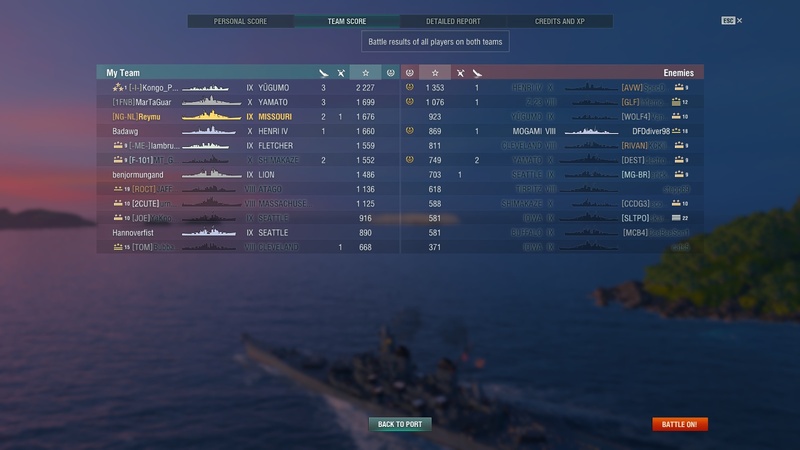 Lots of awful teams, some good and poor play on my part, wayyyyy to many radar ships to make dd gameplay fun and an unexpected detonation to boot. Even some good Zao play negated by bad teams. Funny how sometimes the luck just runs the wrong way. I was out of town for almost two weeks and only returned to randoms on Saturday. The rust showed. As a result, I regret to note, my grind through the Ibuki ended with two bad games in which I misread the map rather badly and paid the price early. I'm trying to decide whether to keep Ibuki. I do still have many of the tier 9s from which I've advanced - Donskoi, Roon, Buffalo (formerly Baltimore), Tashkent - but Ibuki? I mean, it's OK. Meanwhile, I have both Hindenburg and Zao unlocked, waiting for either a sale or a pressing need to buy them to have more tier 10s in port for the anniversary. Of course, the joke is that I hardly play the tier 10s I already have - too obsessed with grinding. Sunday I decided to try to get back into destroyers, starting with Kagero, since I'm not far from Yugumo and someone speculated recently that the Akizuki line completion may bring an IJN DD sale (I have no evidence, mind you.) This was my first game - tier 10, 5 DDs and 3-4 radars (never did figure the enemy Yueyang out) per side, rumors of the demise of the destroyer being somewhat exaggerated. Yup, I'll take it; done for the day, since I didn't think I'd have a better match. Past month has been the worst I have ever had in random.... period. Have lost almost 2/3 of my matches. Crazy. It has been like I am getting all the 7 year olds match after match. But previous month I was at like 53% or something like that. Go figure. Been playing mostly co-op myself lately. I love summer but when it comes to video gaming it can be hell. Semi-retiring from random for awhile. Am on tilt. Of course there are those who will say no problem! Got a 70% win rate for July. I hate them. Well someone has gotta win. That was the mood then. It looks I'm just going to be a lot more random about when I play, if at all. Mostly just the lack of new maps. Last new one was what, 2 patches ago? CWs interest me little and not keen on being a co-op because I'll definitely do bad in it compared to the pve crowd that've done it for ages. It was... Interesting to say the least. My truck is in the shop with the engine torn apart, so I've been stuck in a motel room since Thursday aft. Thus I had lots of time to play. And did so. Just a strange weekend. Either the matches were fun and exciting and I did well- or they sucked royally with little in between. Friday was pretty cool, lots of games, all three containers, both coal missions done, mostly decent games with solid damage and xp/credit returns. Saturday began that way, then I decided to try my luck with something other than high tier USN BB's (grinding Nor-Cal's cptn with NC, AL, MO, etc.) Nothing worked. And I began to get saltier and saltier... After an absolutely horrible game with QE, I said the hell with it: stripped it of all upgrades, sold it, and free xp'd to KGV. QE is nothing more than a patience testing grindwall imo, and a stinking pile of manure. KGV is a much better- and more fun- ship. All of this culminated in a match where I mistakenly believed an ally had deliberately launched a full spread of torps at me- which nearly all hit. (turns out it was one of WG's miracle bots launching torps from the grave...) I blew a gasket, as I already had a bad attitude working... ugliness ensued, and I turned pink. I shut the game off then. No good playing when in that frame of mind. On the upside, I did finish the American Cruiser collection, and earned more than 700,000 credits from all the dupes I had, lol. Sunday also began fun, I jumped in Bougainville and Cheng An to work off the pink, and have some silly fun. Ground out a point on both captains, and racked up huge citadel totals! Then moved on to the missions, and more grinding. Again, I got through all 3 daily boxes, both coal missions, a Kidd mission (CHA CHING!!) and levelled up my captain to 18 points. Where it turned South was when I took out my DD's. And this was all weekend long. I couldn't do a DAMN thing in any of them. The a-hole DD hatin' bots were out all weekend. You guys in Randoms get the radar meta to make you hate playing them- we, in Co-op get bots programmed to make life for a DD player extremely unhealthy, not to mention unfun. And it wasn't just me- most of the truly garbage games in ANY ship, were due to the bots mass charging the DD, and leaving half the team with nothing to shoot at, and the other half (sans the DD who got smashed immediately) with an 8 ship murder ball to contend with. It was annoying as hell, and in response, I mothballed all of my DD's. Not worth wasting any time with, if this is all I'm going to get... A real shame- Benson is (or should be)an awesome ship- but the game seems determined to make me hate it. 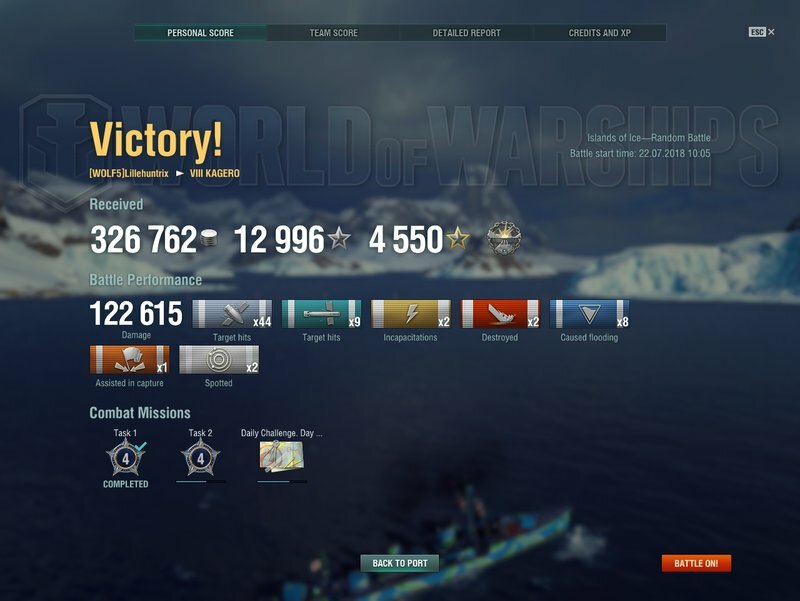 If WG wants an all BB/CA game all the time, then this is a great way to go about it: Make DD players in all modes give up in disgust and/or ragequit until they are as rare as hen's teeth- just like CV's. Guess I'll just join the parade of BB's and cruisers in queue, like everyone else. I've got 4 brand new BB's to play with: Richelieu; KGV; Bismarck, and the tier 4 Frenchie. 2 brand new CA's: Roon and Martel, and I'm now within 50k of Des Moines. And if I get bored, there's always the new USN CL line. Or I can finally get to work seriously on Myoko, which I've had forever, lol. There are also a goodly number of premiums I've never played lost in the 154 ship mess of my port. I made the decision that Benson's 19 point captain will go in Des Moines when I get it. Buffalo will be keeping it's 17 pointer, as it's a keeper ship for me- that beast is just plain NASTY when you put it in the right situation! Until then, it'll be shared between Indy and Atlanta, if I feel like grinding some E-XP. None of the rest have anything of note, really- mostly 12 or 13 pointers. Those will just go in the reserves, to be put in CL's. No DD over tier 4 will see any playtime again, unless something changes. I'm with you on the lack of new maps. Seems very repetitive now, unless you're willing to mix low tier and high tier ships into your gameplay. 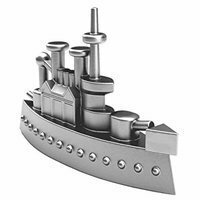 I'd honestly forego new events, premium ships, and scenarios for maybe 2 or 3 new maps. Running new ships on the same old tired maps is like driving a new car on the same road every day. The experience doesn't change much.